"So, naturalists observe, a flea has smaller fleas that on him prey; and these have smaller still to bite ’em; and so proceed ad infinitum." However, lichen are also involved in other forms of symbiosis which are more deleterious - to the lichen anyway. There are parasitic fungi call lichenicolous fungi that have evolved to parasitised lichens. There are about 1500 known species of such fungi and they vary in their specificity and their harmfulness, and some of them form galls on their host. In addition to such parasites, lichen also has to contend with a range of animals that feed on them, including (but not limited to) reindeers, caterpillars, and snails. Since lichens are constantly being attacked from multiple fronts, some species have evolved various forms of chemical defences that make themselves less appetising to animals that try to eat them. But no counter-measures ever survive intact in evolution's battlefield, and lichen-infecting fungi like Plectocarpon lichenum can mess with their host's attempt at avoiding being eaten. The scientists in this study looked at how these parasitic fungi affect their lichen host, specifically how tasty they might be to other animals. Plectocarpon lichenum infects a species of lichen call Lobaria pulmonaria. Generally, snails prefer eating those parasitised lichens over unparasitised lichens, but they avoid eating the parasitic galls themselves (see the photo above where the snail has neatly grazed the lichen around the parasitic galls). So on top of already drawing nutrient away from its host, this parasitic fungus also make the lichen more delicious to the lichen's predators - a double whammy. Now this isn't like other cases featured on this blog where the parasite alters the host to make it more edible because it would help get the parasite transmitted. It doesn't benefit P. lichenum to have the snail munching on its host, but this is simply a side effect (a tasty one for the snail) of the infection. But how is how is P. lichenum causing this? 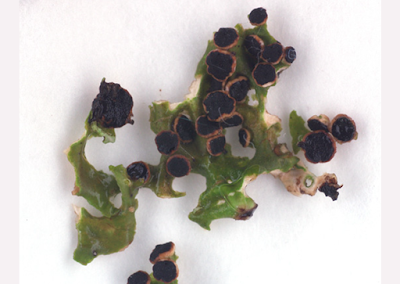 The scientists measured the level of carbon and nitrogen in both parasitised and unparasitised lichen, and found those with the parasitic galls had lower concentration of carbon. In addition to altering the nutritional content of L. pulmonaria, parasitised lichen also had lower level of defensive chemicals. So is this reduction in defensive chemicals the reason why the snails preferred parasitised lichen? While it seems to make intuitive sense, that turned out not to be the case. When they remove the influence of those defensive compounds in both parasitised and unparasitised lichen by rinsing them with acetone, the snails still preferred the parasitised lichen. Despite being in the same genus, these two parasitic fungi affected their lichen host differently. In any case, the effects that P. lichenum have on its lichen host was what the scientists had predicted, but not for the reasons they had thought. This shows that ecological interactions are often messy and complicated, and the dynamics found in one particular relationship or species may not be applicable to another - even if they are closely related. There are many examples in nature where parasites are able to alter their host's behaviour in some way. More recently, some scientists have been investigating just how the parasite are altering or controlling host behaviour. Most of them had looked at the chemicals secreted by the parasites to lull the host into compliance, but the study we're featuring today looked at something different - how the behaviour of the parasite itself can affect the behaviour of the host. The star of today's post is Tylodelphys - a parasitic fluke which infects a small freshwater fish in New Zealand call the common bully. In order for this parasite to complete its life cycle, Tylodelphys must enter the gut of a fish-eating bird, which would naturally involve the unfortunate fish being eaten by the said bird. While it is in the common bully, Tylodelphys dwells in its host's eyes in the vitreous liquid between the lens and the retina (see video here). Unlike other species of flukes which turn into dormant cysts at a similar stage of development, Tylodelphys stays active and free to roam around inside the fish's eye - which provides it with plenty of opportunity to get up to all kinds of parasitic hi-jinx. 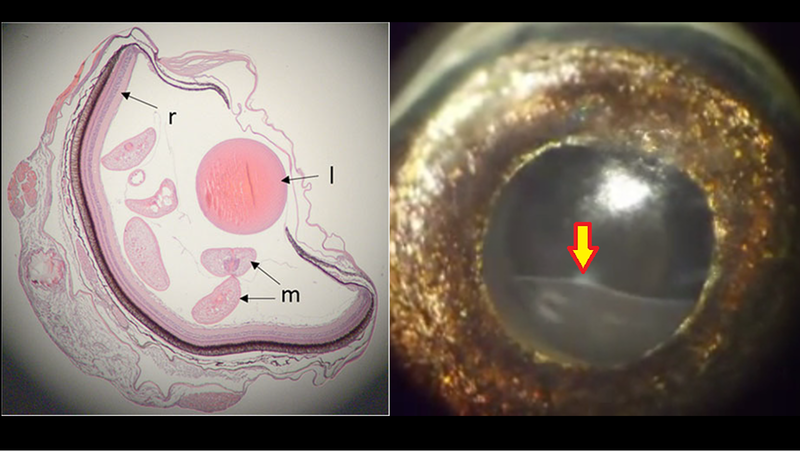 When Tylodelphys larvae are crawling around inside a fish's eye and happen to get in between the retina and the lens, this can partially blind the fish and prevent it from being able to notice incoming predators such as birds. To examine what Tylodelphys gets up to during the day, researchers at the Otago Parasitology Lab collected some common bullies and gave them eye examinations using an opthalmoscope (yes, like the one used for your eye exam). Using the opthalmoscope, they captured a series of short videos of the infected fish's eyes at different time of day, and watched what eye flukes got up to. They also performed histology to examine if the flukes are damaging the fish's eyes. The bullies they examined varied in how heavily infested their eyes were - this range from just having a single fluke in the eye, or it can be up to seventeen flukes, with the average being about seven. Living in a crowded eye is not good for the parasites either, as the researchers found that flukes from heavily infected fish are comparatively smaller. But despite being found in a vital and sensitive part of the host body, Tylodelphys was otherwise a relatively benign tenant - they didn't mess up any eye tissue. Compare this with other species of eye flukes which can cause cataracts in the eye of their fish host, Tylodelphys seems rather well behaved. However, that does not mean Tylodelphys isn't bad news for the bully - just that its modus operandi is more subtle. Instead of impairing the fish's sight by damaging the eye, as mentioned the above, when the flukes position themselves in front of the retina, they act like internal blinkers. Surprisingly, fish that are more heavily infected didn't have their retina more covered up by the flukes than less heavily infected fish, which means it's not simply the sheer number of flukes that blinds the fish - it's something else the flukes are doing. Tylodelphys has a daily routine and shifts its position in the eye throughout the day. During day time, the flukes sit between the lens and the retina, blocking the host's line of sight. But at night, they settle down to the bottom of the eye, allowing the fish to see properly again. But if Tylodelphys is trying to get its host eaten by a predator, why doesn't it just stay in front of the retina all the time? That is probably because not all predators are the same for Tylodelphys. During the day, the main predators of bullies are fish-eating birds (which are Tylodelphys' final host), whereas at night, the main predators are longfin eels (which are not suitable as host), so it'll be good for to the fluke if their host fish can still see and avoid the incoming predators at night. So the flukes keep this fish's eyes covered during the day, but move aside to not get in the way at night, and this seems to follow a circadian rhythm. While this helps the fluke reach its final bird host, the reason why this behaviour manifests probably has nothing to do with trying to change the host's behaviour. As mentioned above, unlike other flukes that become a dormant cyst at this stage of development, Tylodelphys keeps growing so it needs to feed - and the only thing around to eat in the eye of a fish is the fluid in the eye's vitreous body. The partial blinding of the fish host during daytime might simply be a side-effect of the parasite's feeding routine. So while the fluke moves around in the fish's eye to get its daily dose of eye jelly, this also produce a useful side-effect by making the host more vulnerable to fish-eating birds. Such "useful side-effects" could be how many parasite host manipulation tactics have evolved. Indeed, that is often how evolution often work; co-opting preexisting features and behaviours into new roles. To understand how a parasite affect the behaviour of its host, sometimes perhaps it is best to start with studying the behaviour of the parasite itself. Dinosaurs and other prehistoric animals were also infected with all kinds of different parasites - see this page to find out more! We do not give any medical or veterinary advice. If you think you or your pets have a parasite, please seek the appropriate care you need from your own doctor or veterinarian. The United Nations declared 2010 the International Year of Biodiversity. In celebration of the enormous diversity of parasites and to highlight their importance, we created this blog, which showcased a species of parasite every day. Now that 2010 is over, we will continue to add more parasites from time to time, and write about any newly published research on parasite species that we have posted about yet. See this post from the start of 2011 where we discuss the sheer scale of parasite biodiversity, and this post from the end of 2011 pretty much summarizes the mission of this blog. Craig Gritzen, University of Utah. Take Your Parasites With You! Check out "This Week in Parasitism" - a weekly podcast about parasites! Got parasites? The American Society of Parasitologists is interested. We invite you to share with us your observations, ideas and questions about parasites. Our members and The Journal of Parasitology represent a wide range of research interests including ecology, evolution, systematics, immunology, biochemistry and molecular biology. Please post any aspect of parasitology you wish to share with us on our Facebook Group Page. Please go to our home page at http://asp.unl.edu/ and look for the ASP on Facebook link. Bush, Albert, Gerald Esch and Jacqueline Fernandez. Parasitism: The Diversity and Ecology of Animal Parasites. Cambridge University Press. Combes, Claude. The Art of Being a Parasite. University of Chicago Press. De Kruif, Paul. Microbe Hunters. Houghton Mifflin Harcourt. Desowitz, Robert. New Guinea Tapeworms and Jewish Grandmothers. Norton & Company. Desowitz, Robert. The Malaria Capers: Tales of Parasites and People. Norton and Compay. Karlen, Arno. Biography of a Germ. Pantheon Books. Moore, Janice. Parasites and the Behavior of Animals. Oxford University Press. Poulin, Robert. Evolutionary Ecology of Parasites. Princeton University Press. Poulin, Robert. Parasite Biodiversity. Smithsonian Institution Press. Rohde, Klaus. Marine Parasitology. CSIRO Publishing. Zimmer, Carl. Parasite Rex. Simon & Schuster. Bog Leech's Parasite Buttons, Magnets, etc. We had over 113,000 unique visitors to the blog in 2010 and more than 161,000 page loads! Thanks to all!